Hotel Indigo and Holiday Inn Express are built adjacent to the renovated Joo Chiat police station, a heritage building. If you’re looking for a unique, locally-inspired stay in Singapore, check in at Hotel Indigo Singapore Katong, a new boutique hotel that draws inspiration from the local neighborhood of Joo Chiat or Katong, the country’s first heritage town renowned for its Peranakan (Straits Chinese) heritage, evidenced by the exquisitely preserved shophouses in the area. Throughout the hotel, one can find Peranakan culture and heritage interpreted in a contemporary manner – a refreshing break from the standard modern hotels you find elsewhere in the city! A wall garden greets visitors at the entranceway, inspired by the gardens of traditional houses. 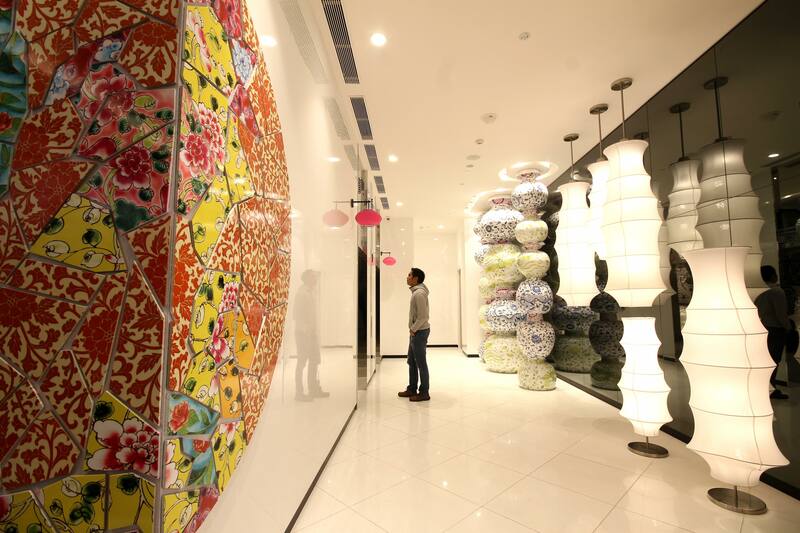 Entering the property, the reception area is decorated with colorful tiles, urns and lanterns. 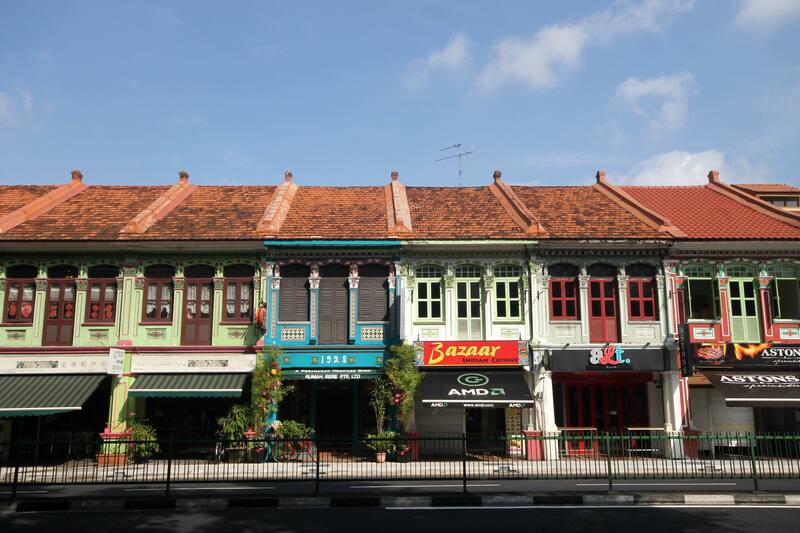 The Joo Chiat or Katong neighborhood is Singapore’s first heritage town. Among the appointment-only museums you can visit in the neighborhood are Katong Antique House and The Intan. Besides the heritage neighborhood, the hotel is a stone’s throw away from East Coast Park, a waterfront that’s popular for outdoor fitness activities like running and biking. Next door, Holiday Inn Express Singapore Katong is a sister budget hotel for no-frills customers that features vibrant rooms, express breakfast service, self-service laundry and a 24-hour fitness corner. Each room features beautiful interiors, its layout and decor inspired by the Katong neighborhood. 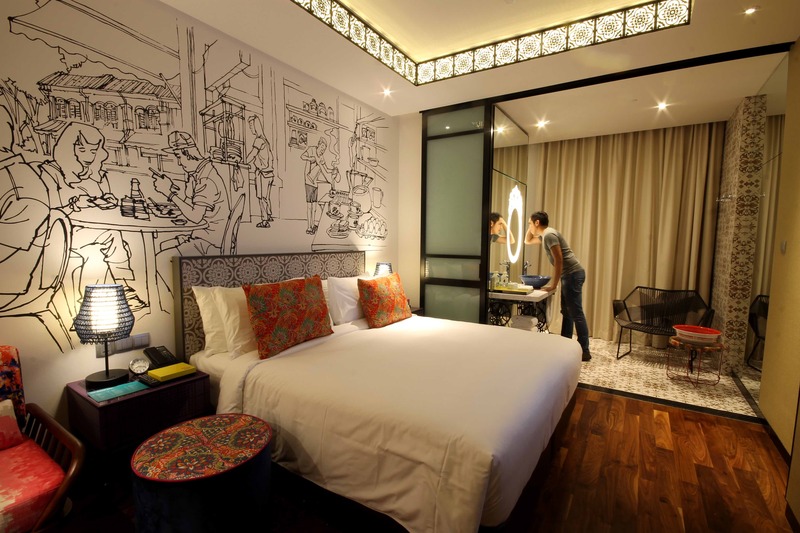 While Hotel Indigo Singapore Katong has 131 rooms, it maintains the personalized service of a boutique hotel. Each room is beautifully designed, keeping with the Peranakan inspiration. The room is narrow, mimicking the layout of traditional shophouses, and features a large cartoon mural of a local neighborhood scene. The spacious shower area with large windows overlooking the heritage neighborhood evokes a spa experience, replete with foot scrub and bath salts. I particularly loved the nostalgic attention-to-detail like the jars of sweets like White Rabbit in the cupboard, and the Good Morning hand towel in the bathroom that evoke a sense of the past, little things that also remind me of my childhood in the Philippines. While it’s tempting to stay in their rooms the whole day, don’t miss out on visiting the roof deck area with its 24-hour fitness center and swimming pool with gorgeous panoramic views of the Katong neighborhood! The hotel lobby is decorated with Peranakan-inspired tiles, vases and lanterns. Breakfast, lunch and dinner are served at Baba Chews, the on-site Peranakan restaurant housed in a renovated heritage building: the former Joo Chiat Police Station. 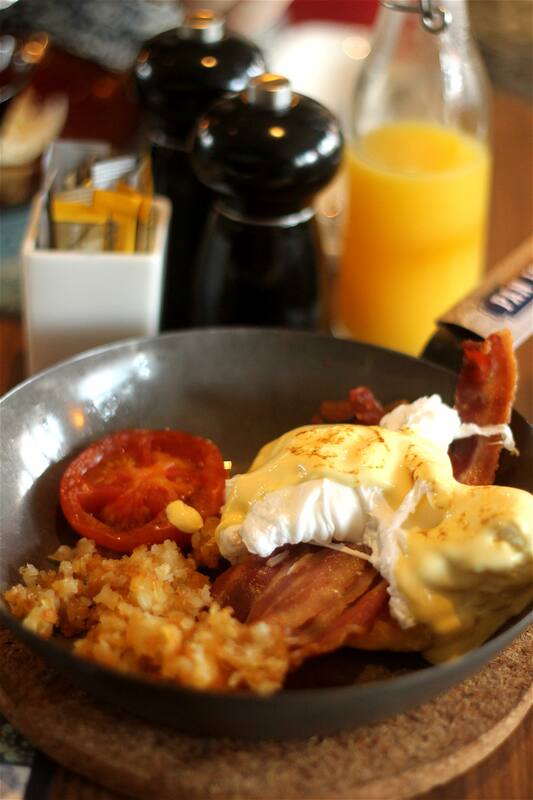 Continental offerings are served buffet-style, but breakfast mains are served ala carte and cooked-to-order. I had an excellent pan of Eggs Benedict for breakfast. There are also several dining options at the adjacent 112 Katong mall and along the main drag of East Coast Road. 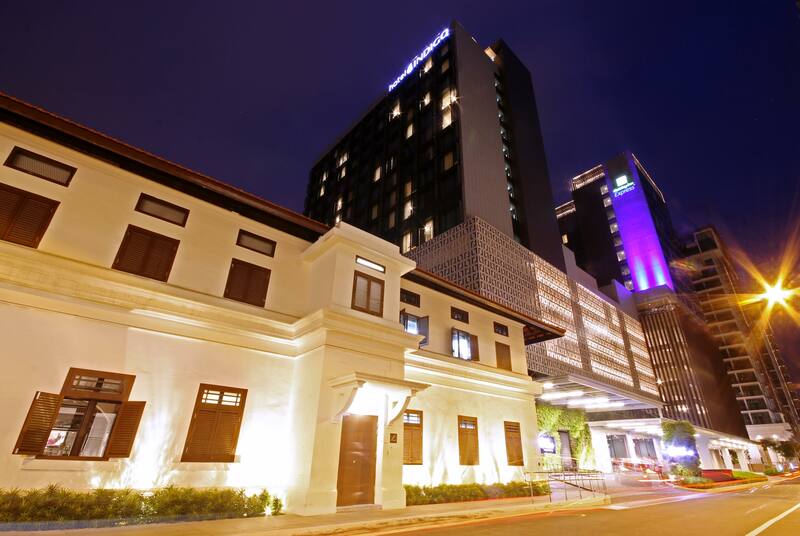 Accommodation at Hotel Indigo Singapore Katong starts at SGD 157 (PHP 5,646) for a King Deluxe Room. The next-door sister budget hotel Holiday Inn Express Singapore Katong offers rooms starting at Find discounted room rates for both hotels here! Unfortunately, there are no MRT stations very near the hotel as of now. Marine Parade MRT station of the upcoming Thomson-East Coast Line near the hotel will open by 2023. Presently, the closest stations are Paya Lebar and Eunos along the East-West Line, from where you’ll have to take a bus or taxi. However, one can take a bus to the city center from a number of bus stops near the hotel. Use Google Maps for navigation. From Changi International Airport Terminal 2, take Bus 36 and alight at Marine Parade Road, between Blocks 72 & 74, after the intersection with Still Rd. From here it’s a 10-minute walk to Hotel Indigo Singapore Katong. Use Google Maps for better navigation. Travel time takes approximately 45 minutes.